Plain sponge with lemon curd buttercream decorated with meringues and white chocolate. Our chefs have been inspired by the classic flavours of lemon meringue to create this cake, full of summery citrus flavour. The spiralled layers of light sponge are rolled with a smooth lemon curd buttercream, delicately flavoured with fragrant Sicilian lemon oil. It's then decorated by hand with more buttercream, curls of white Belgian chocolate and crisp meringue pieces. 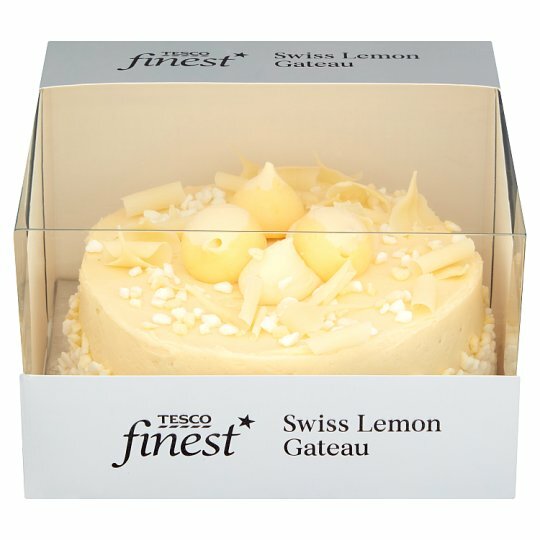 Beautifully crafted lemon meringue decorations add the perfect finishing touch. INGREDIENTS: Lemon Curd Buttercream (56%) [Icing Sugar, Butter (Milk), Glucose Syrup, Humectant (Glycerol), Water, Sugar, Acidity Regulators (Citric Acid, Trisodium Citrate), Salt, Modified Starch, Concentrated Lemon Juice, Sicilian Lemon Oil, Lemon Juice, Emulsifiers (Mono- and Di-Glycerides of Fatty Acids, Polyglycerol Esters of Fatty Acids), Preservative (Potassium Sorbate), Dried Egg, Gelling Agent (Pectin), Colour (Beta-Carotene), Stabiliser (Sorbitol), Flavouring], Wheat Flour, Sugar, Pasteurised Egg, Humectant (Glycerol), Dextrose, Glucose Syrup, Water, Palm Oil, Dried Skimmed Milk, Pasteurised Egg White, Shea Fat, Raising Agents (Disodium Diphosphate, Sodium Bicarbonate), Cocoa Mass, Wheat Starch, Rapeseed Oil, Dried Whole Milk, Emulsifiers (Mono- and Di-Glycerides of Fatty Acids, Polyglycerol Esters of Fatty Acids, Soya Lecithins), Palm Stearin, Whey Powder (Milk), Milk Sugar, Preservative (Potassium Sorbate), Salt, Flavouring, Stabiliser (Sorbitol), Acidity Regulator (Citric Acid), Colour (Beta-Carotene), Antioxidant (Citric Acid).